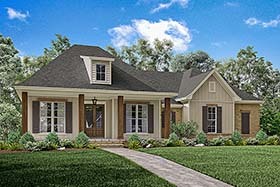 This beautiful Acadian design offers a tremendous layout that utilizes every square foot. 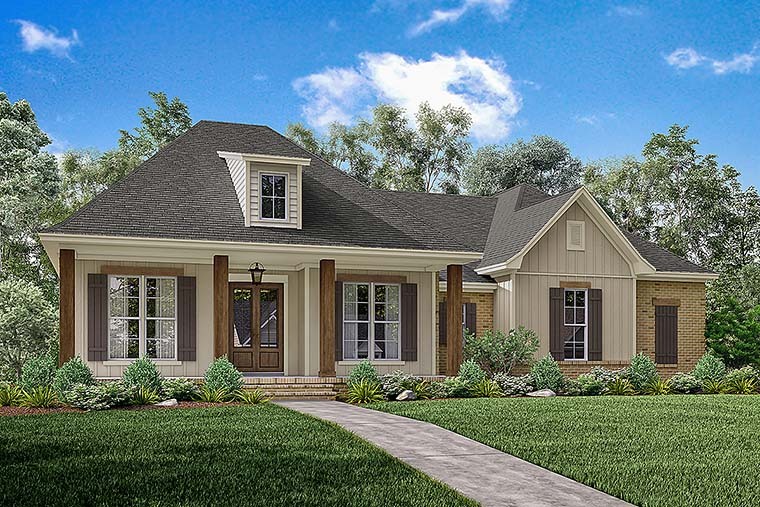 The elegant exterior features an inviting front porch perfect for those relaxing evenings with family and friends. A formal foyer and dining space open into a large open living area with raised ceilings and brick accent wall. The large kitchen has views to the rear porch and features an island with eating bar as well as a large pantry. The 3 bedrooms are well-sized and all include walk-in closets. As an extra feature, a bonus space is also provided that would be perfect for a guest suite or that family game room. This plan really does have it all! Question: Do you have a version of this plan with a garage and a fireplace in the corner of the great room? Answer: We do not have a version with a fireplace, but that would be an easy item for your builder to add during construction. Thanks and have a great day! Click Here to download a free PDF Brouchure of Plan Number 56908.